Several basic steps are performed during sample processing regardless of the type of test being done. The general procedures include the isolation of the DNA, RNA or Proteins from a sample, labeling or staining, hybridization and washing. 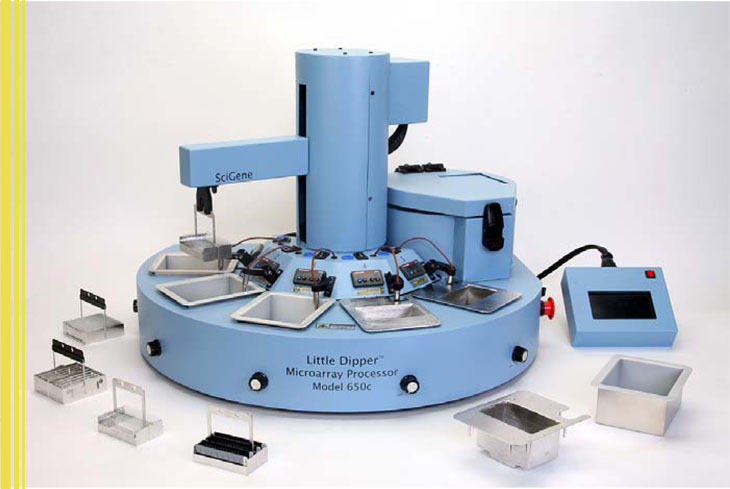 AlphaMetrix offers a set of tools and systems to help the scientist process the samples. This includes workspace compartments to remove ozon (NoZone Compartments), incubators (Hybex and CytoBrite Systems) and hybridization ovens (Scigene 700 and 777 Series) as well as automated processors (Scigene LittleDipper) for staining and washing. ⇒ #1090-00-1) was developed to eliminate nagging concerns of ozone corrupted array data caused during array washing and scanning. ⇒ parts per billion (ppb). ⇒ emerge from the catalyst cartridge is then removed by a HEPA filter before exiting the unit. Under normal atmospheric conditions of temperature, humidity and ozone, the catalyst used in the scrubber need not be regenerated or replaced during the lifetime of the unit. ⇒ photometric method of measurement. However, high performance ozone analyzers that measure in the ppb range are expensive. Also, only periodic measurements of ozone levels in the lab or within a NoZone Enclosure are normally needed. ⇒ microarray data during scanning of arrays using GenePix scanners (MDS Analytical Technologies). ⇒ lower speed rotation for Agilent and other microarray chambers that use bubble-mixing. ⇒ 777 Oven is not limited to GeneChip Arrays and can be operated at lower rotational speeds for Agilent and other microarray chambers that use bubble-mixing. The flexible design eliminates the need to purchase a special oven or waterbath for different types of microarrays reducing operating cost and freeing up valuable bench space. ⇒ chambers. The Model 700 Oven can also be used with a variety of other rotators and accessories from SciGene for other applications. ⇒ wash buffer/reagent temperatures and times, agitation rates and centrifuge/drying conditions. Each system arrives configured for your platform and programmed with recommended protocols. ⇒ slides are moved at programmed times between temperature controlled baths containing Agilent wash buffers and solutions. While submerged in each bath, arrays are reproducibly washed using a combination of up/down agitation and stir bar vortex action. After the washing steps, arrays are air dried or coated with a stabilization solution using a slow withdrawl of the rack from the final bath as specified by Agilent. ⇒ times between five temperature controlled baths containing wash buffers or blocking/staining reagents. While submerged in each bath, BeadChips are reproducibly washed, blocked and stained by a combination of up/down agitation and stir bar vortex action. The final drying step is automatically performed in an integral centrifuge. ⇒ between baths containing buffers in validated protocols. While submerged in each bath, arrays are washed using a combination of programmed up/down agitation and stir bar vortex mixing. For best results, the system is used within a NoZone Workspace to eliminate day-to-day assay variability caused by high ozone levels. The tight control of time, temperature, ozone levels and washing action assures superior array-to-array and batch-to-batch reproducibility. The Hybex Microarray Incubation System simplifies microarray incubation and processing to reduce costly errors and enhance the reproducibility of results. The system is comprised of the Hybex Microsample Incubator and two humidified chambers. ⇒ chamber is then circulated through movement of the rotator to ensure temperature uniformity. A precision controller regulates the temperature to &plusminus; 0.10°C and displays both set and actual temperatures. An external jack connected to a probe within the chamber can be attached to a digital thermometer for temperature calibration and instrument certification. ⇒ washing microarrays or other applications. ⇒ heating base with removable block for PCR plates and a waterbath insert for heating wash buffers (purchase separately). The system may also be used with an Illumina MIDI heat block (BD-60-601). 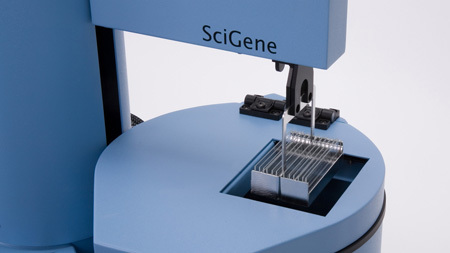 ⇒ heating base with heated lid and removable block for flat-bottom plates used with QuantiGene 2.0 Assays.